Tonight's Demo is by Jr. Strasil. This is his first iForge demonstration. Our 157th. 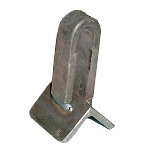 Click for Detail The parts to make a simple bottom V swage that will make the forming of the petal easy and will also be useful for other projects. 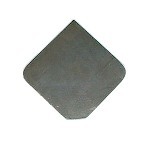 It is 1-1/2 inches of 3/16 by 1-1/4 inch angle iron with all the edges and corners rounded slightly with a piece of 1/4 by 3/4 bent 180 degrees to fit the Hardy Hole. 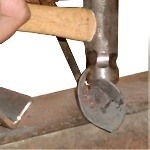 Click for Detail The V swage arc welded together. 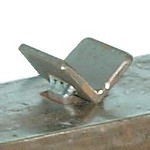 Click for Detail The V swage setting in the Hardy Hole ready to be used. 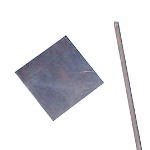 Click for Detail The two parts of the lilly, in this case a piece of 16 gauge material 3 inches square, and an 18 inch piece of 1/4 inch hot rolled round bar. 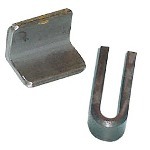 Click for Detail The piece of 16 gauge with the two outside corners rounded, and the cut off for attachment to the stem, the length of the bottom cut should be 1-1/2 times the circumfrence of the rod. 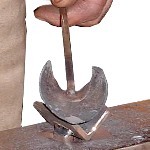 Click for Detail The rod welded to the petal in the middle of the bottom cut. 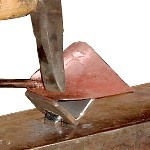 Click for Detail Working the bottom edge of the petal first with a cross-pein hammer, the far edge has been rolled some already, do not work so much of the first edge that you have to straighten some of it back out to get to the second edge. Click for Detail What it should look like with the edges rolled and the center worked a little. 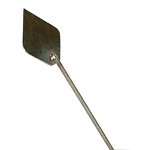 in quite handy at times. 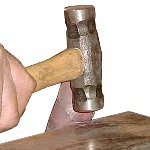 Click for Detail Use the flat face of the hammer to finish rolling the edges around, they should overlap some. 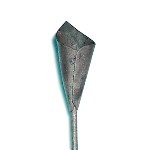 Make sure to work the the bottom of the petal close around the stem, do not work all in one place, try to keep the edges as straight as possible. 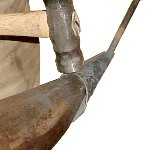 Click for Detail Work the edges together on the horn of the anvil using the flat face of the hammer. 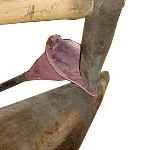 Click for Detail Using the horn of the anvil as a bottom fuller and the round face of the hammer to finish closing the base of the petal around the stem, this is done at a red heat. 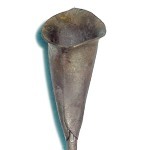 The stem should also be aligned with the petal at this time and the stem straightened. Click for Detail This is what the project should look like at this stage. 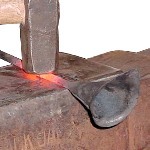 Click for Detail At a red heat, roll the edge of the petal over on the round edge of the anvil, but do not go all the way to the back, then do the other side the same way, using a round face hammer. 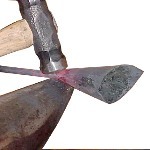 Click for Detail Using a cross pein hammer roll the the tip of the petal over the anvil horn. 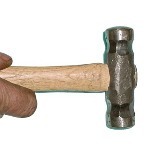 Click for Detail Lightly hammer the stem to give texture if you wish. 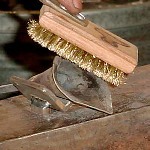 Click for Detail Wire brush with steel wire brush to remove scale and while petal is at a black heat, highlite the edges of the petal with a brass wire brush both inside and out. Click for Detail The finished Calla Lilly Candle cup. 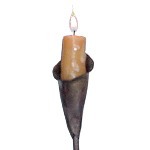 Click for Detail This is a large Calla Lilly made from a 5 inch square piece, with a snub end scroll base for larger candles. Nice demo, Irnsrgn! I especially like the use of the brass brush at the end. Always adds a bit to the piece and the price. 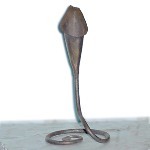 Could the end of the stem be forged into a c--- (can't remember the name) in the middle of the lily? Sort of like a Jack In The Pulpit? You can try it paw paw, I always tell people to not be afraid to expierement, don't see why not. Thank you all for letting me do a demo for you. Thanks Irn-- another neat project. Good photos too, easy to see steps.